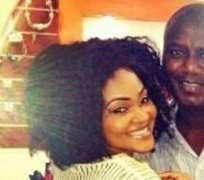 Nollywood actress, Mercy Aigbe Gentry, is very fortunate to have a loving husband who does not joke with her at all and prefers to step out with her in most occasions. This was revealed recently when her husband expressed his love towards her which is kind of rare since Mr. Gentry is always a busy man. Gentry recently disclosed that his wife, Mercy, is the only one for him while sharing a picture of himself cuddling her.